Tumbleweed, 505 N 24th St.
Come have lunch on Tumbleweed and learn more about our efforts to end youth homelessness. In a small group setting, you will be treated to a tour and short presentation by the Executive Director and Tumbleweed Board to learn how Tumbleweed supports close to 1,000 youth a year in five different programs. Last Chance Pub & Cider Mill, 2203 Montana Ave.
Join us for Pint Night on September 25th from 5pm to 8pm. $1 from every pint purchased will be donated to Tumbleweed. 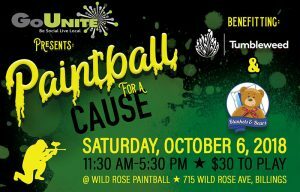 Hosted by Wild Rose Paintball and GoUnite and benefitting Tumbleweed and Blankets & Bears. Join us in wearing blue to help @DHSBlueCampaign bring awareness to #humantrafficking. 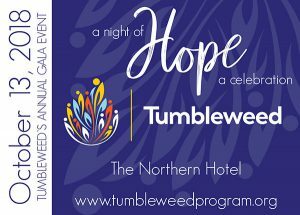 Help Tumbleweed spread awareness in Billings! January is National Slavery & Human Trafficking Awareness Month. Get your favorite piece of blue clothing ready for January 11th and take a photo of yourself, friends, family, and colleagues wearing blue and post it to Facebook with #WearBlueDay and don’t forget to tell us why you wear blue! Tag Tumbleweed in your pictures, we can’t wait to see Billings turn blue! If you're interested in joining us for lunch to learn more about Tumbleweed please call 406-259-2558 to reserve your spot today! City College's Nursing Club is hosting a fundraiser night at Five On Black! When you mention them or Tumbleweed when you check out between 3-9 pm 50% of sales will be donated to the MSU-B Nursing Club, they in turn are donating 100% of the proceeds to Tumbleweed! Check out a new to Billings restaurant for dinner! Tumbleweed provides safety, assistance and hope to our community’s vulnerable and homeless youth, creating lasting life changes.